Tibial tubercle osteotomy is a surgical procedure which is performed along with other procedures to treat patellar instability, patellofemoral pain, and osteoarthritis. 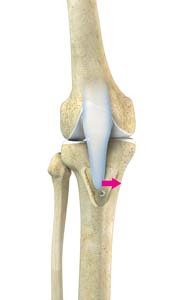 Tibial tubercle transfer technique involves realignment of the tibial tubercle (a bump in the front of the shinbone) where the patellar tendon inserts; thus, changing the direction of where the kneecap (patella) traverses in the femoral groove. Lateral patellar maltracking is corrected by moving the tibial tubercle medially, towards the inside portion of the leg. For arthritis, there is typically a transfer of the tibial tubercle anteriorly or “out in front” which creates more space between the kneecap and the femoral groove; this removes the load off the painful portions of the kneecap. Surgical treatment is indicated when physical therapy and other non-surgical methods have failed and/or there is a history of multiple knee dislocations. Tibial tubercle osteotomy and transfer is done through an incision made in the front of your leg just below the patella. In osteotomy procedure, a periosteal incision of 8-10 cm length is made at 1cm medial to the tibial tubercle. With the help of an oscillating saw, a cut is made medial to the tuberosity and a distal cut is also made. The tapered design of the distal cut avoids the risk of tibial fracture. Similarly, a proximal cut is made using appropriate instruments such as curved osteotome or reciprocating saw. Then an osteotomy through the bone cortex is performed without cutting off the lateral periosteum. The lateral periosteum serves as a point of attachment for the osteotomy segment. By doing this, a tibial tubercle segment which is more than 2 cm in width, more than 1 cm in thickness and 8-10 cm length can be obtained. It should include all portions of insertion of the patellar tendon. The segment from the tibia is then levered using osteotome. The osteotomy segment is then moved under direct vision into a position that assures proper tracking of the patella. The tracking pattern can be confirmed arthroscopically. The mobilized bone is then fixed into its new place using screws, which can be removed later if they cause irritation. There will be a period of 6-8 weeks of restricted weight-bearing on the leg. You may have minimal to moderate knee discomfort for several days or weeks after the surgery. Oral pain medications will be prescribed that helps control your pain. Keep the operated leg elevated and apply an ice bag over the area for 20 minutes. This decreases swelling as well as pain. You will have a leg brace, which may be removed only while sitting with your leg elevated. Physical therapy exercises should be done as it helps in regaining mobility. Eat healthy food and drink plenty of water. Risks following tibial tubercle osteotomy surgery are rare, but may include compartment syndrome, deep vein thrombosis, infections and delayed bone healing.